Please click this link to read answers to questions you may have about DFLs. If you need more information or still have questions, please contact CTI by email or call +1-650-967-2045. A license can be activated many times on the same, or a different PC. However, multiple concurrent activations of the same license are blocked by the system. In other words, if I activate a license on machine A, and then wish to activate it on machine B, I first have to deactivate it on machine A. Deactivation of a license is done by pressing the Deactivate button on CTI License Manager. Internet access is required for this. The user is responsible for activating a license on their PC. First close SonarWiz to prevent accidental damage to the license file. Then rung CTI License Manager and press the Activate button. Enter the License ID and Key supplied by CTI. You would typically deactivate a license so that it can be moved to another machine. Deactivation is done by closing SonarWiz first, then launching CTI License Manager and using the Deactivate button. Doing this deletes the license file on the current PC and flags that installation of the license as deactivated in our database. In order to activate the license again, you will need the original license ID and activation key (password). You will need to refresh a license after it has been edited by CTI staff. For example, after an new EMA expiry date has been set, or a new module has been purchased. 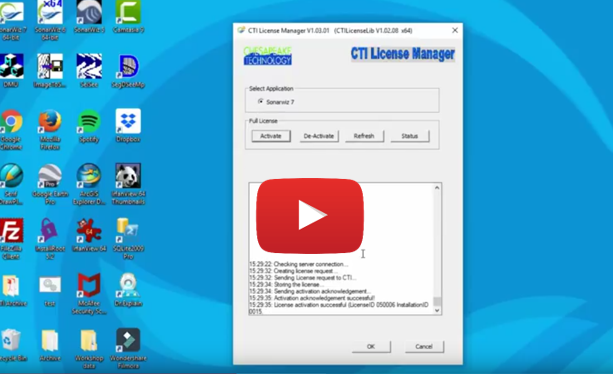 To refresh the license, simply close SonarWiz, launch CTI License Manager and press the Refresh button. You do not need to know the license ID or password.